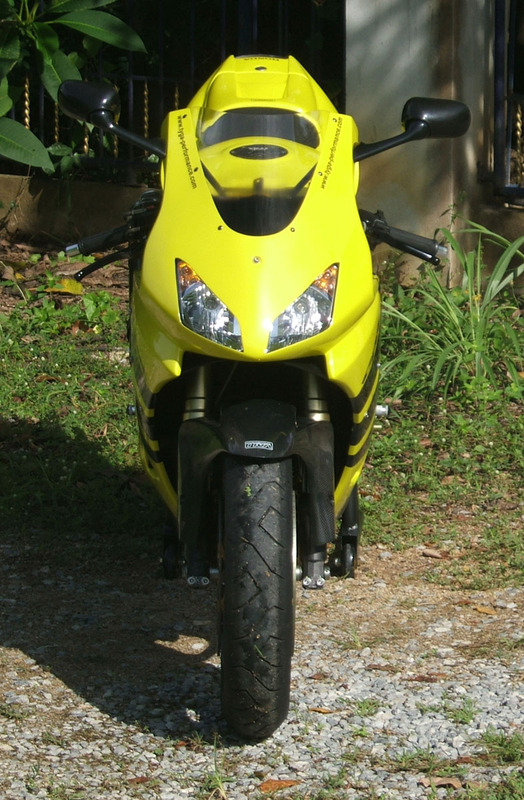 If we start from the front and work our way back, you will see that the front end is nothing like the original MC22 one. 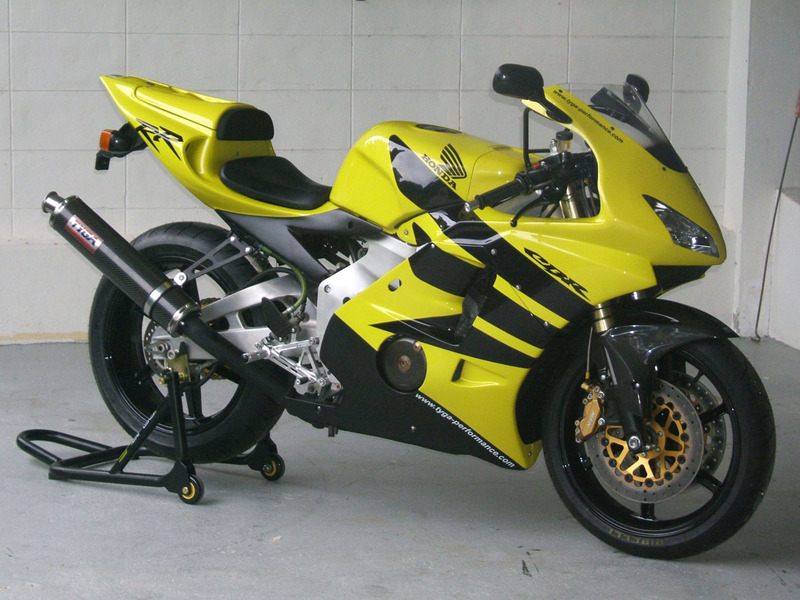 We did actually have the complete RS250 front end fitted at one point but realising we didn't have a triple clamp design ready and that the RS forks are quite short, we changed our plan and decided on the tried and tested NC35 RVF400 forks. These were clamped to a set of NC35 TYGA CNC upper and lower triples but with a special custom stem and steering stoppers to fit the MC22 frame, and the whole lot secured by a TYGA aluminium steering stem nut. 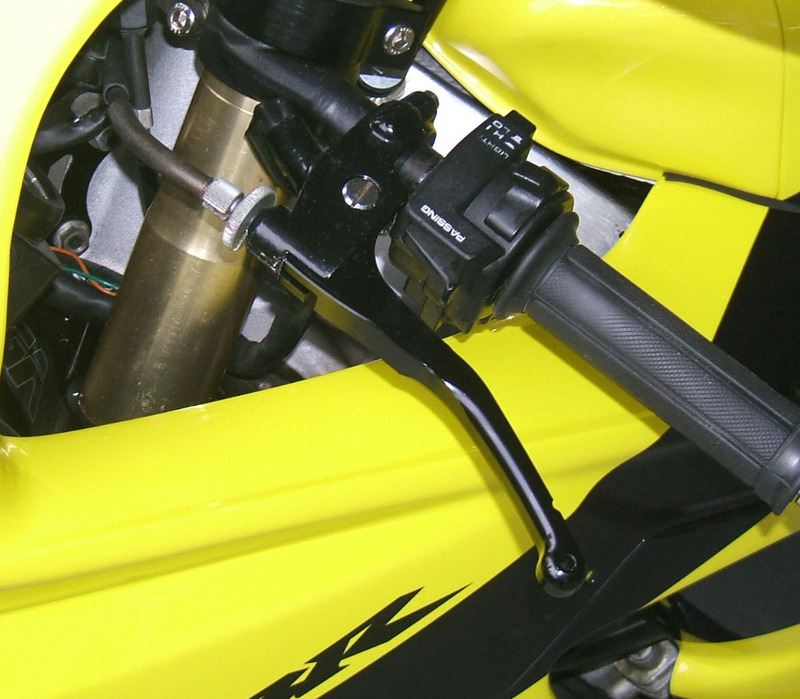 With trial fitting it was obvious that there was not a lot of clearance for handlebars with the bodywork on full steering lock. 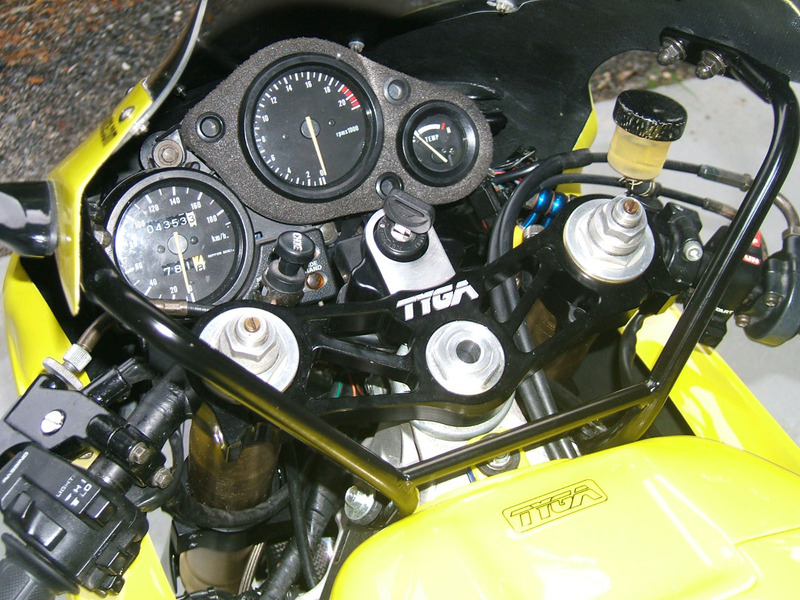 We solved this by fitting a pair of VJ22 handlebars instead of the TZR250 ones we had initially earmarked which were more radically sloped downwards. 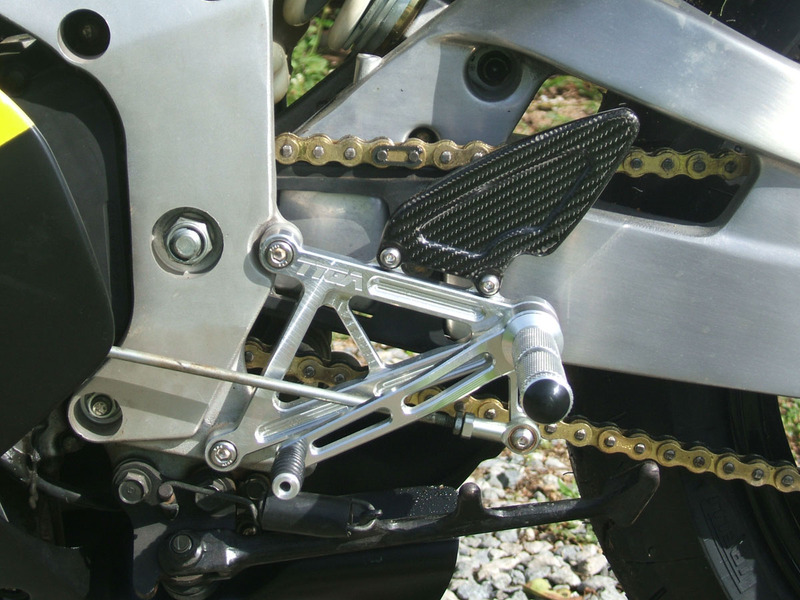 Next Matt machined a custom key lock holder so that it could sneak into the given space between the NC35 triple and the CBR frame. 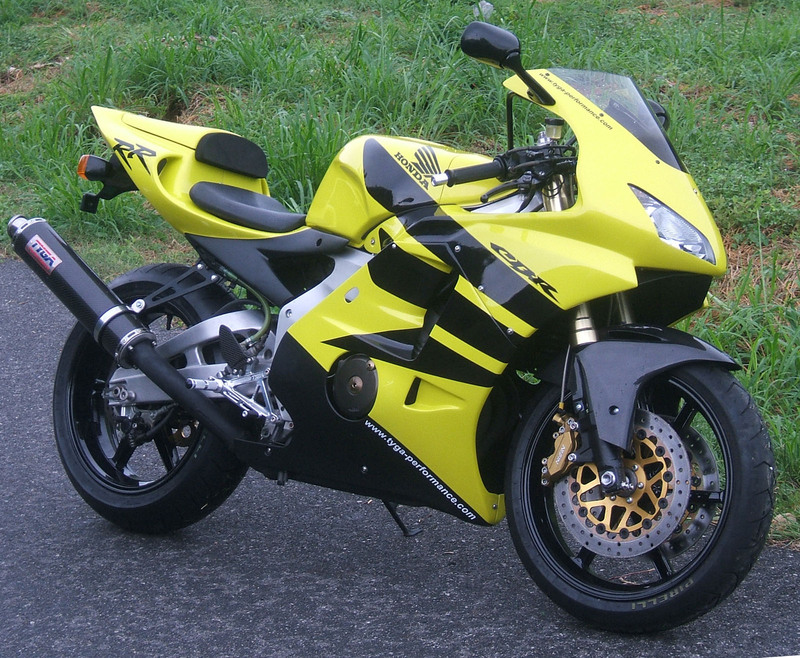 To our surprise, it even still functions as a steering lock which was a bonus. There were then other challenges fitting throttle cables and switchgear given the limited space given by the new lower bars. 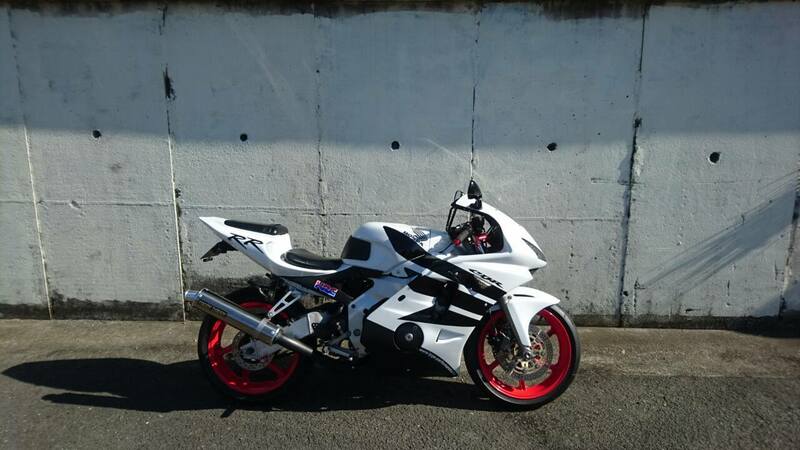 With a bit of patience and juggling around, we eventually got everything to clear and to work, as well as look like the bike had been rolled out of Hamamatsu factory in this spec. 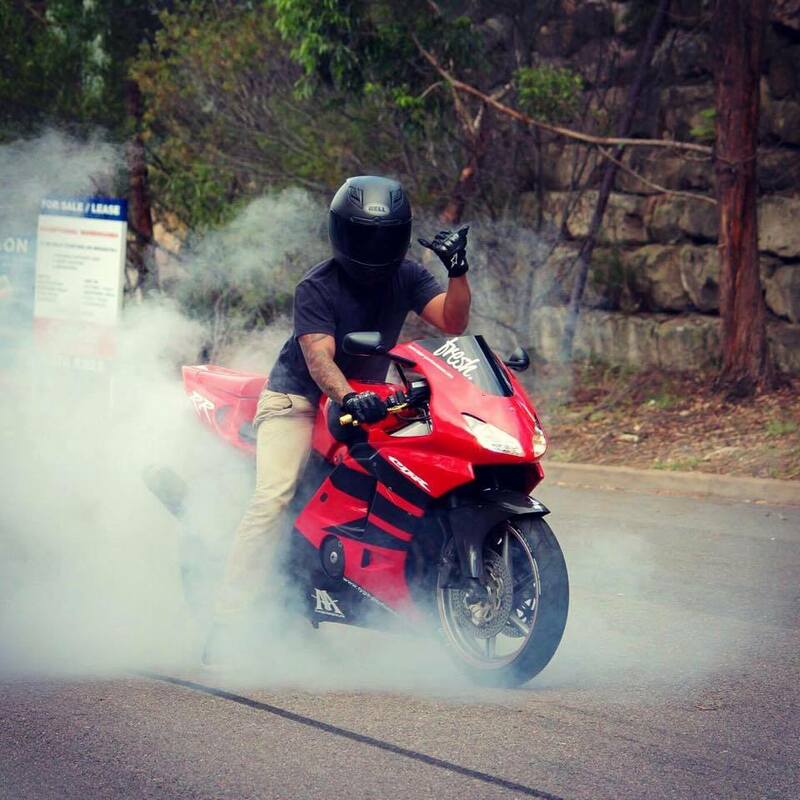 The front wheel is a 3.75 inch magnesium Marchesini off an RS250 GP bike. Being only .25 inch narrower than the original rear, we were a bit apprehensive that it would look a ridiculous but once the 120/70 tyre was fitted and the wheel installed with some one off spacers , it looks the part. 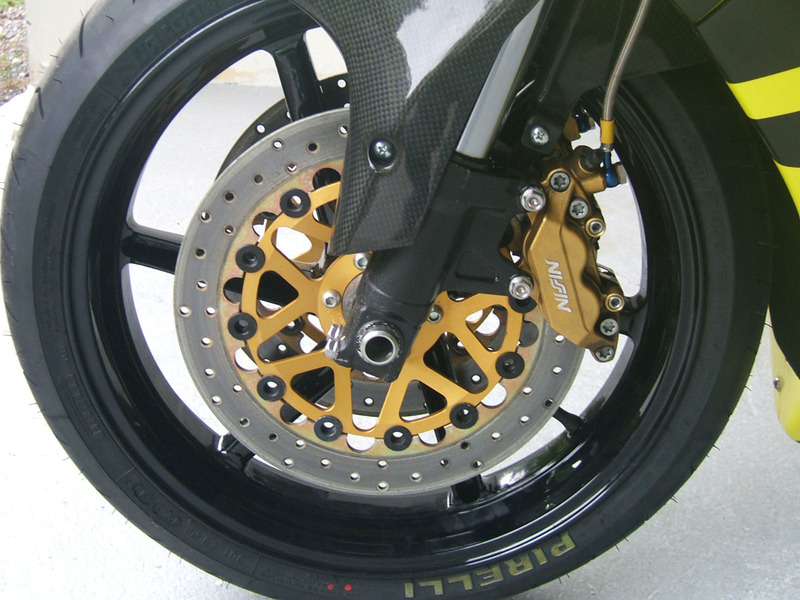 The wheel is fitted with a pair of our rotors and is grabbed by a pair of SP2 Nissin calipers. 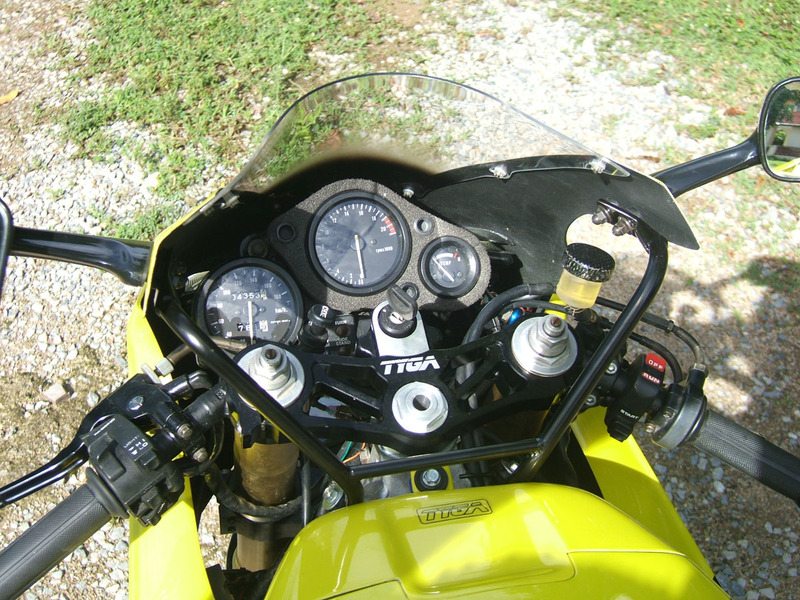 Lines are braided and the master is a 14 mm NSR250 one with a carbon mini reservoir fitted for effect and to keep the dash uncluttered. This pretty much completes the front end. Moving to the rear, our goal was to get a wider wheel in and to do so, it was obvious that the stock swing arm was way too narrow. 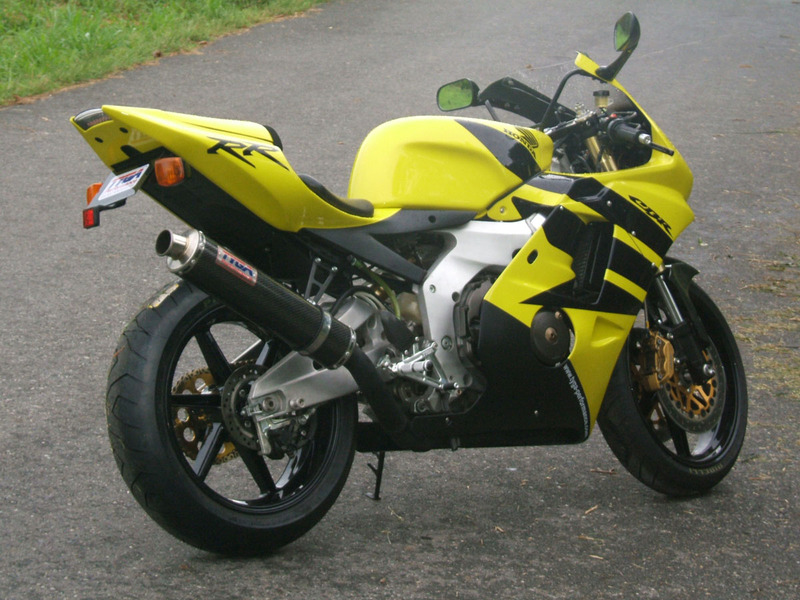 An MC21 NSR250 one would be the obvious choice if it were not for the sloped rear shock position and it came down to the two CBR400RR swingers of which we choose the NC23 in the end because we had one at hand and it looks nice and chunky. 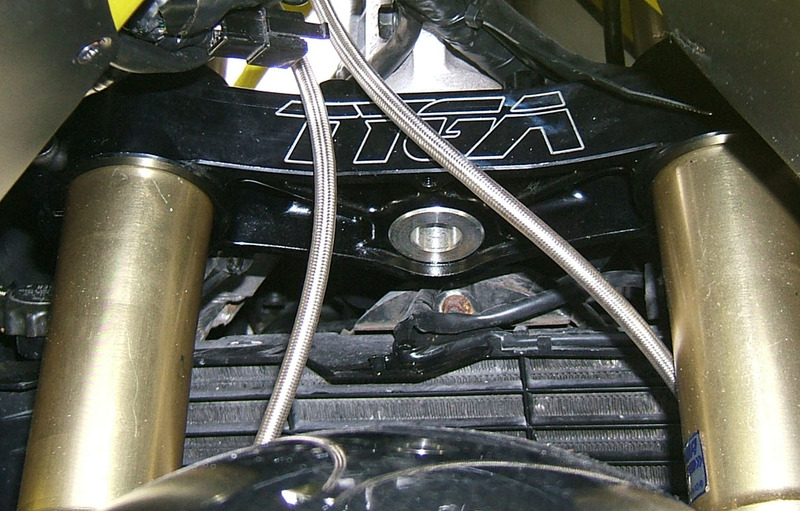 The conversion is not particularly difficult and the pivot points and linkages are all in the correct place. It is then a case of choosing the correct components, making bushes and spacers and getting everything to fit. 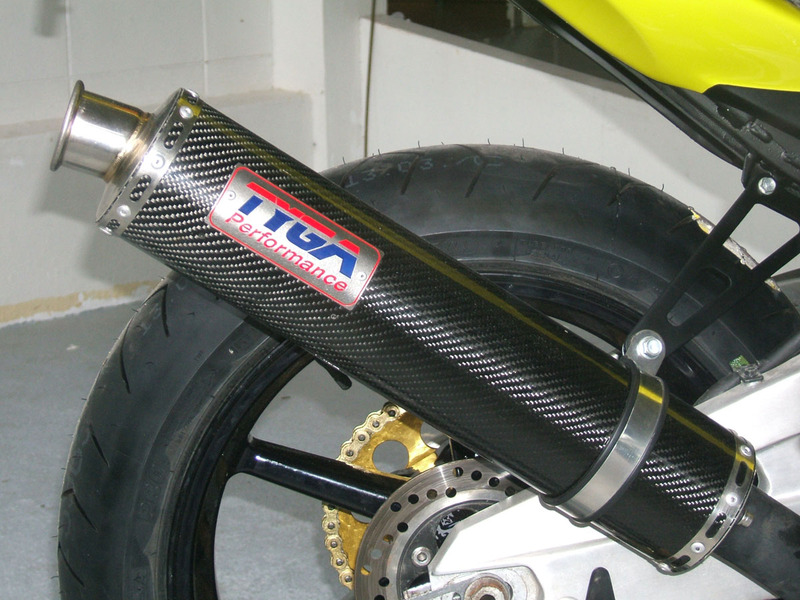 The rear shock is a custom made one by Matt. 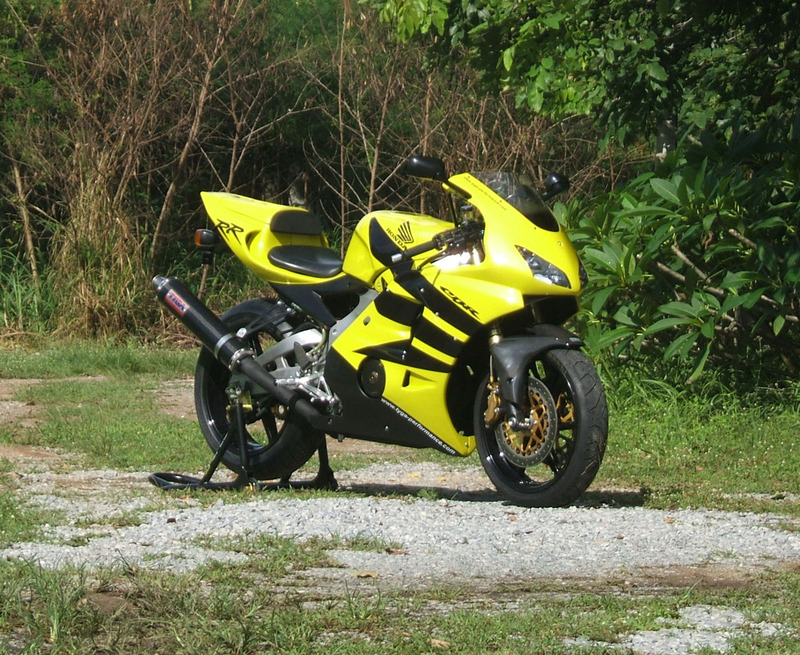 He did his usual lego inspired act of building a shock out of suitable parts from various ones he had sitting around the workshop and we now have a three way adjustable remote gas rear shock worthy of any superbike. Just to show it off, he painted the spring gloss white and fitted some nice anodised braided fittings. 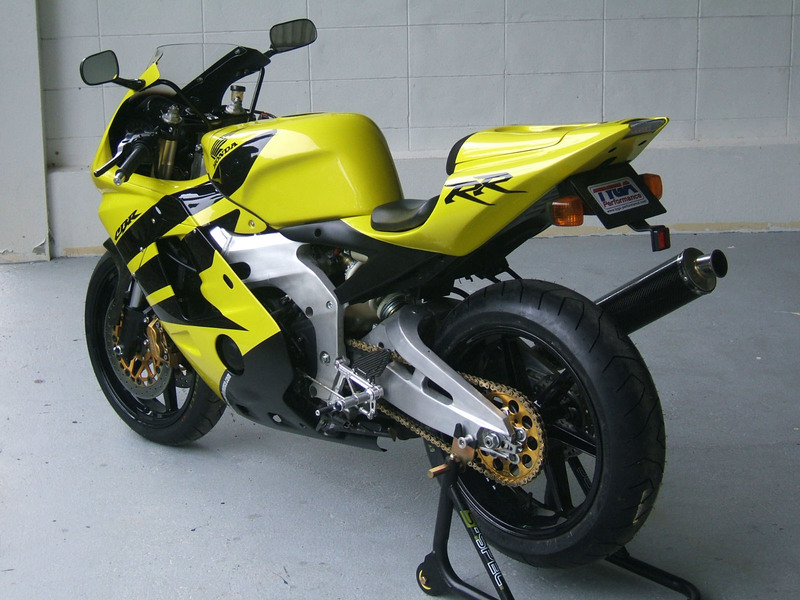 It retains the stock CBR250RR valve, with a little adjustment to the shimming, but the rest is basically a mixture of CBR250, NSR250 and NC30. 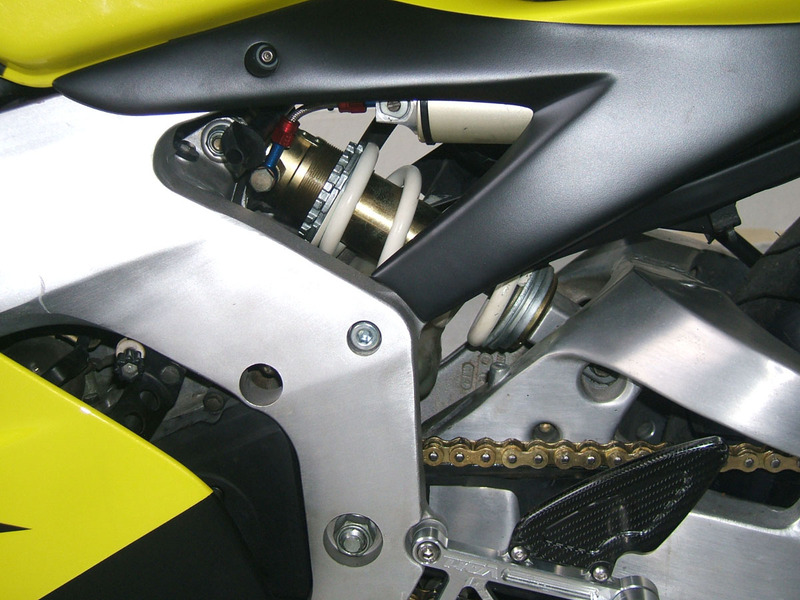 Before fitting the rear wheel, there were further modifications done to the swing arm. Various protrusions from the castings such as the chain guard lugs were removed and the whole unit polished to remove the cast finish, followed by a going over with scotchbrite to get the brushed effect you see now. The 'mud flap' on the stock undertray needed a little surgery to avoid collision too. 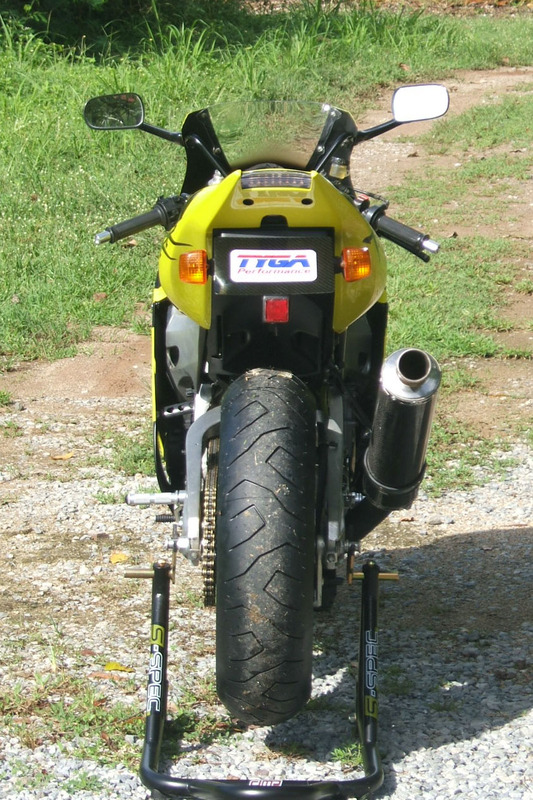 Finally holes were drilled and mounts made for the rear stand bobbins and the RS250 rear caliper torque arm. 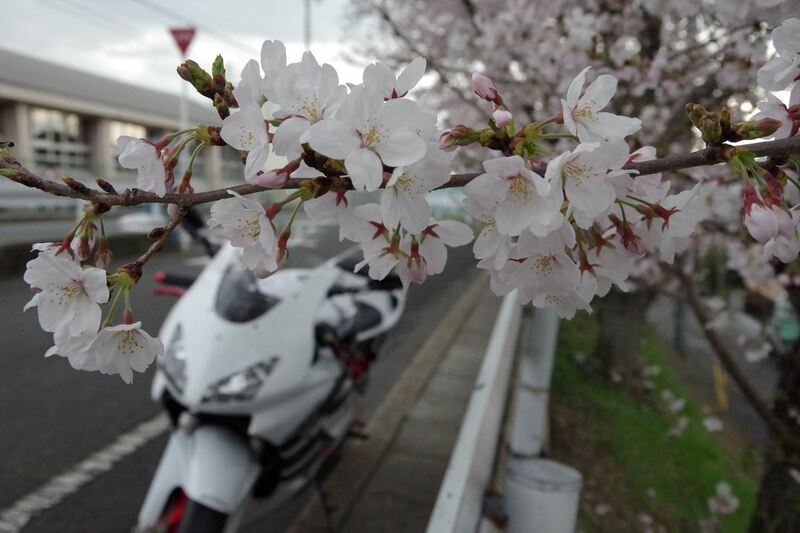 We were now ready of the rear wheel. 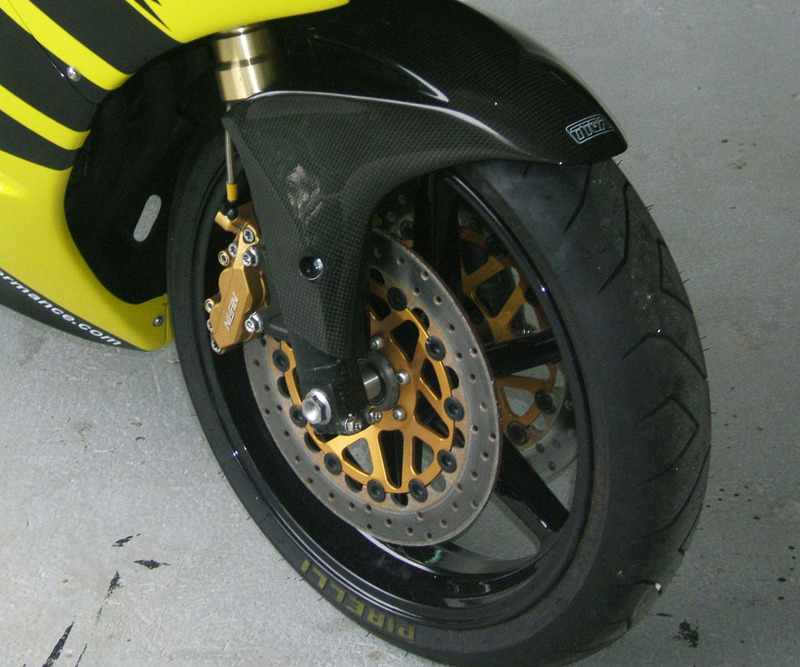 This is also a magnesium Marchesini and is probably the widest wheel anyone has attempted to put into a 250. Well, we had already done a similar conversion to the NRS and the NC23 swing arms and MC21 swing arms are almost identical dimensionally so we were confident of this bit of the job. A special spacer was made so we could use our CNC sprocket holder. 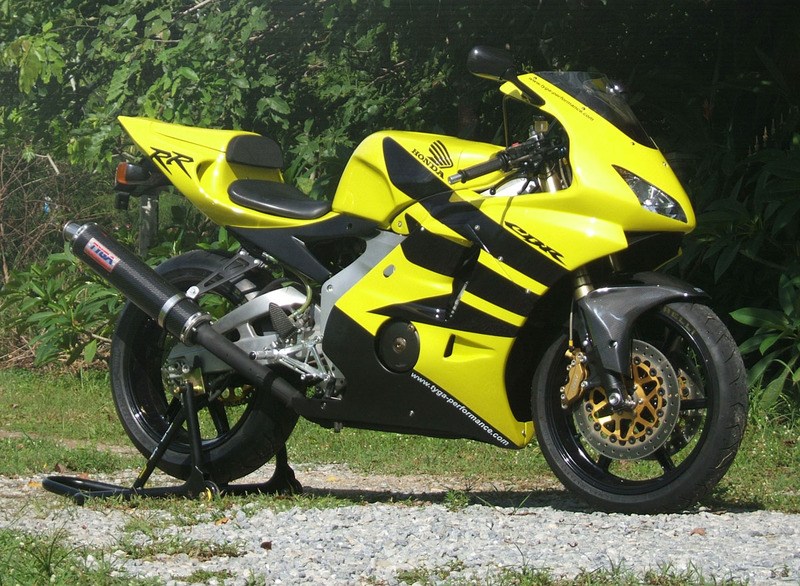 This is installed with an AFAM rear sprocket. 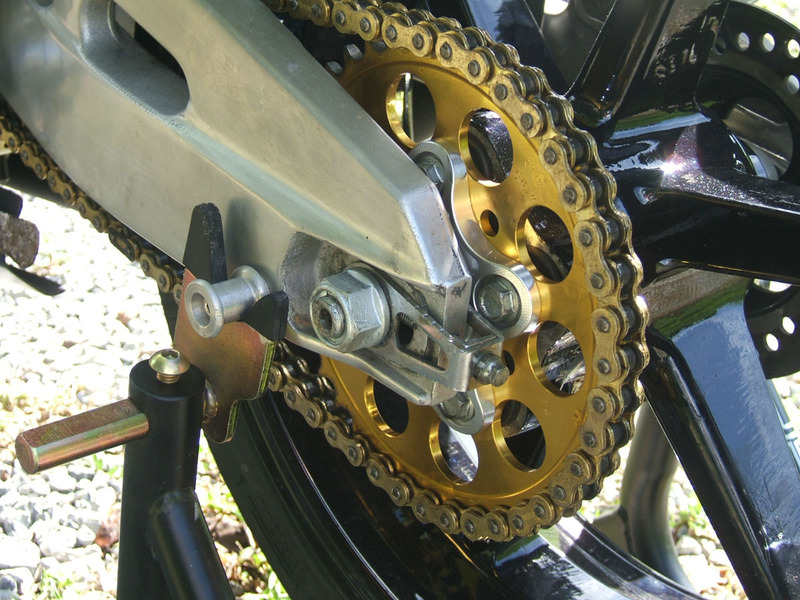 The bike now runs a 520 chain with a ZXR250 front sprocket to match the spline shaft and the chain. On the other side of the wheel, with our swing arm already prepared, it was a relatively straight forward job of fitting an RS250 rear rotor, mini underslung caliper and torque arm. 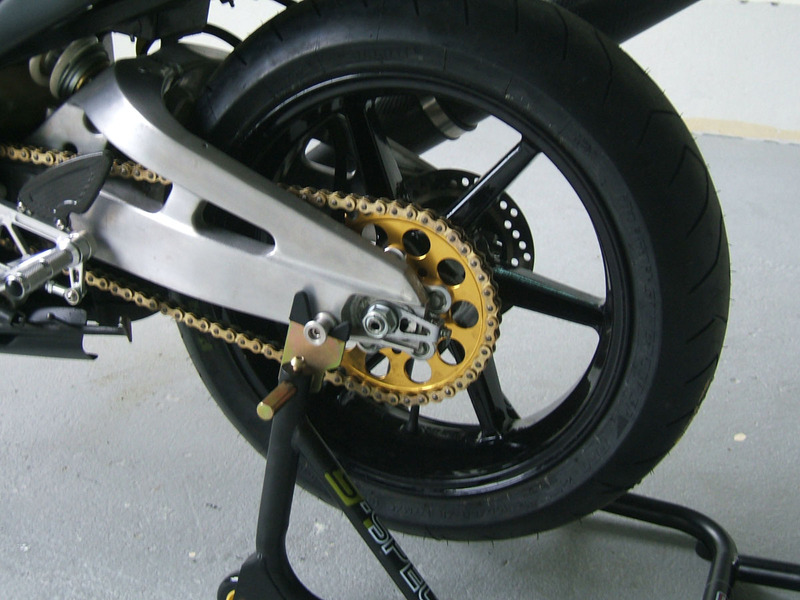 The tyre is fitted with a 160 section tyre and there is clearance and proper alignment for the chain all the way to the front sprocket and back which is part luck and part careful measurement. 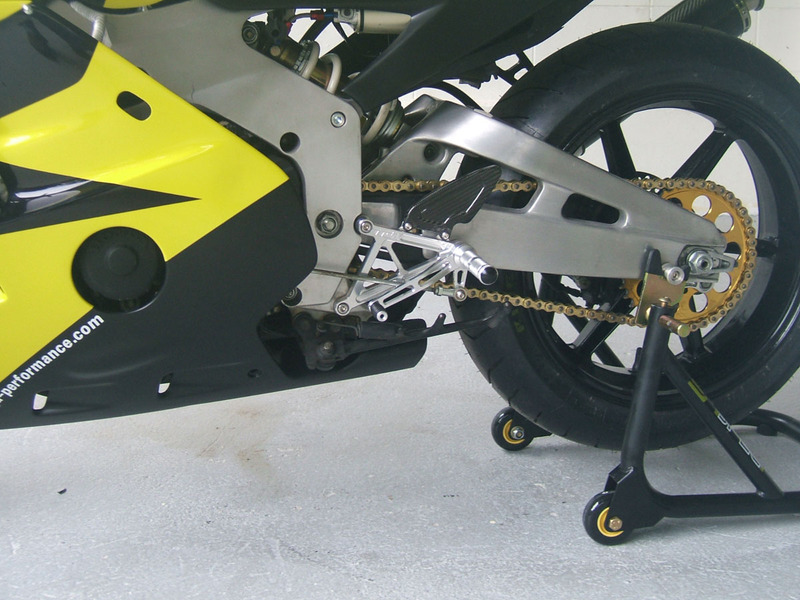 The step kit shown here is a new product and is designed for a stock bike. 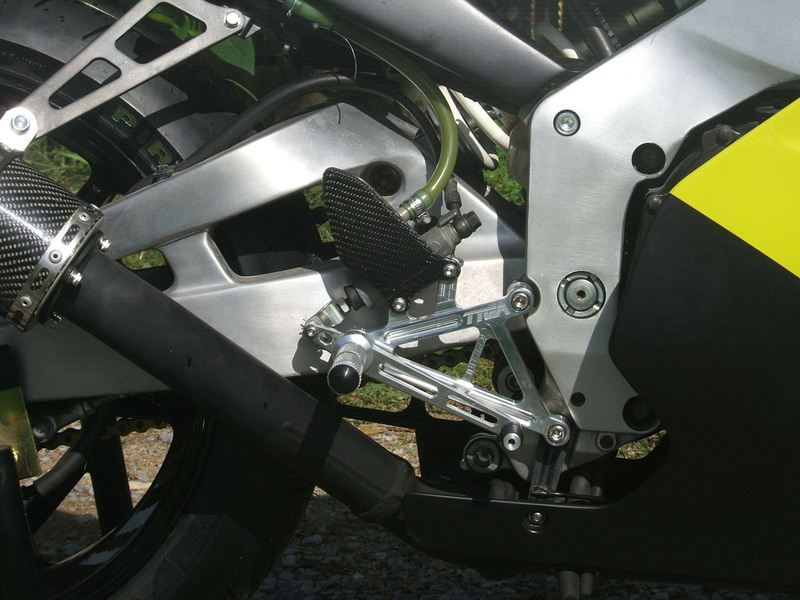 With careful spacing to clear the wider swing arm we were able to get this kit to fit our project bike and show how the kit looks when fitted on a bike. 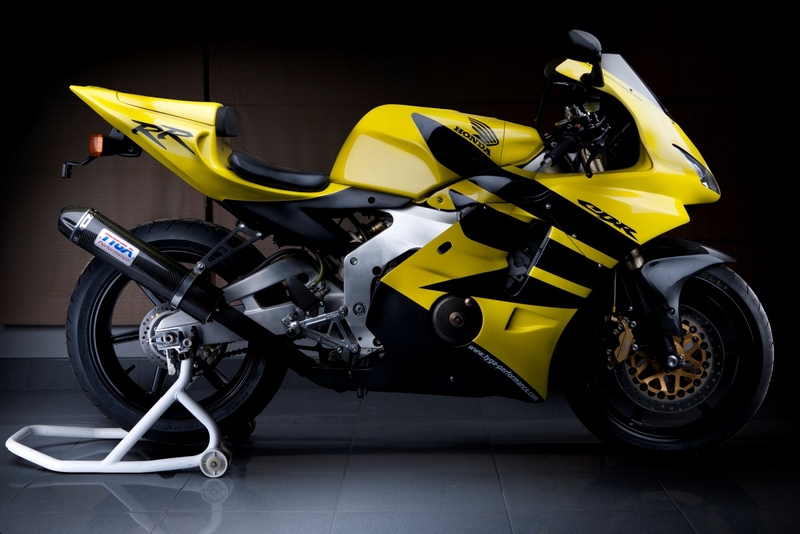 The irony is, that it is designed for a stock swing arm so actually looks even better on a stock bike. 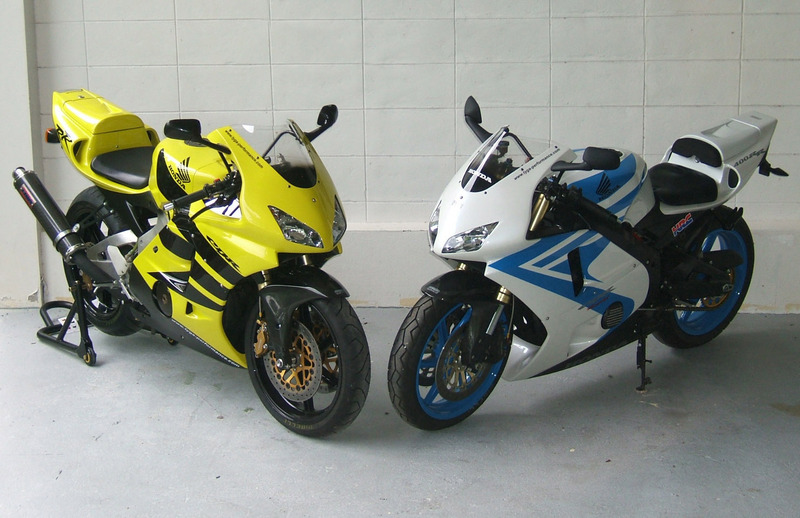 The left heel guard is included in the kit but the right side one is actually designed for a GSX-R K9 but fits perfectly and suits the kit and in keeping with the other side. 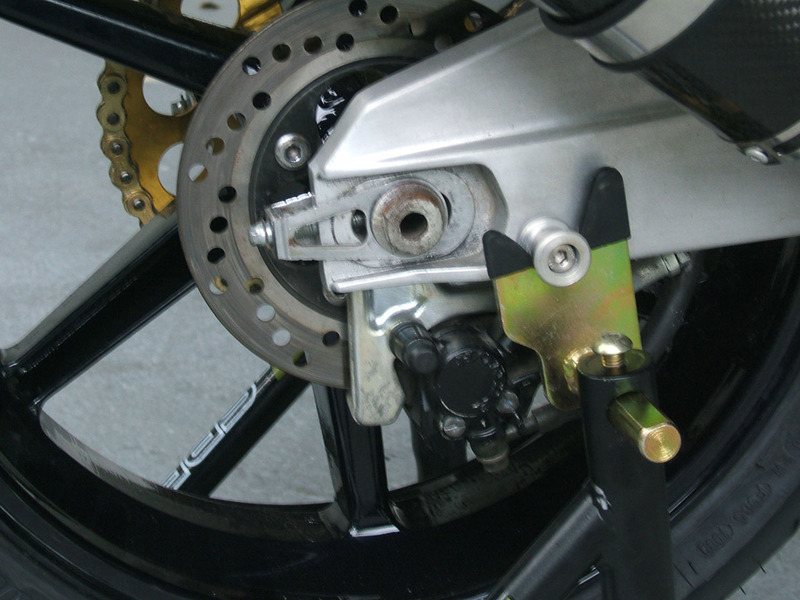 The brake is fitted with an HRC reservoir kit. This completes the chassis mods. 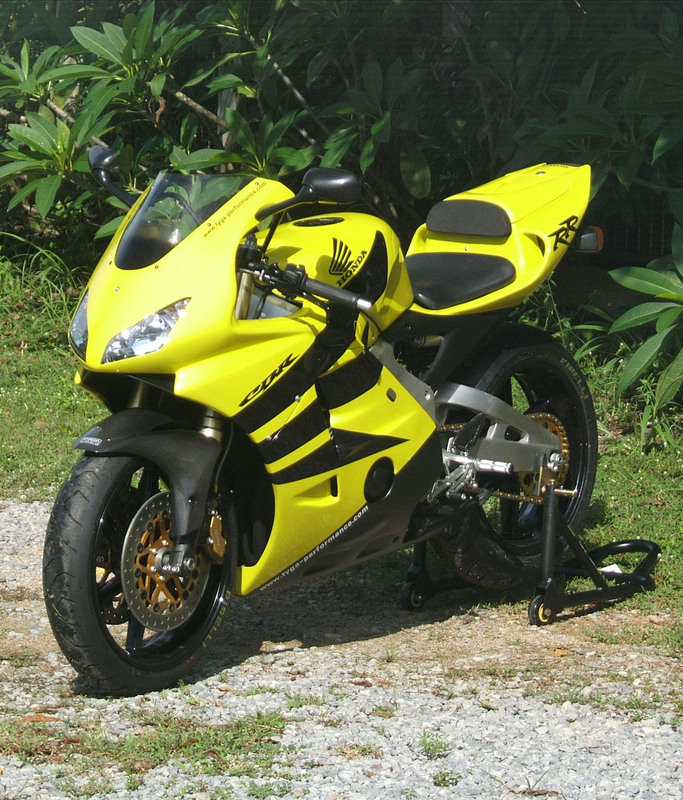 Moving to the aesthetics, the bike is obviously fitted with one of our body kits. This is the T8 kit with a lower screen to give it a lower appearance. 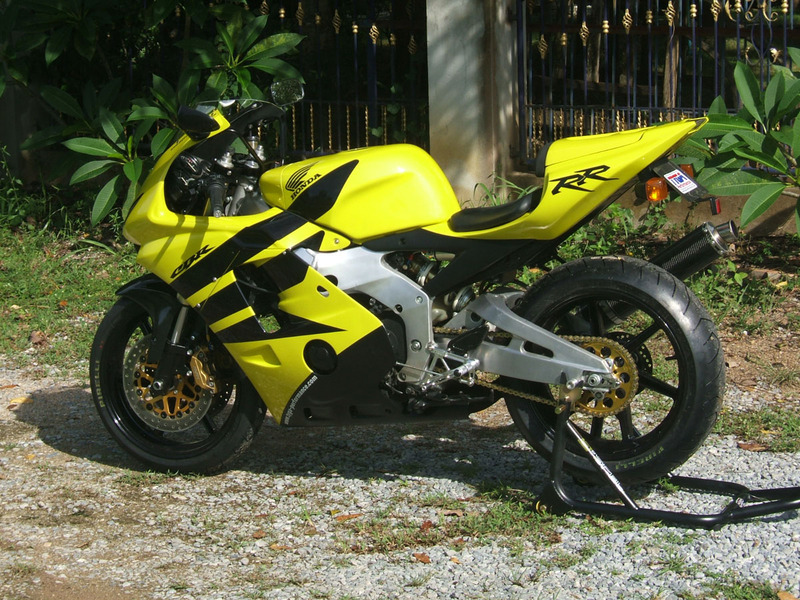 The kit consists of everything you need to replace the old 90s style bodywork with something up to date. 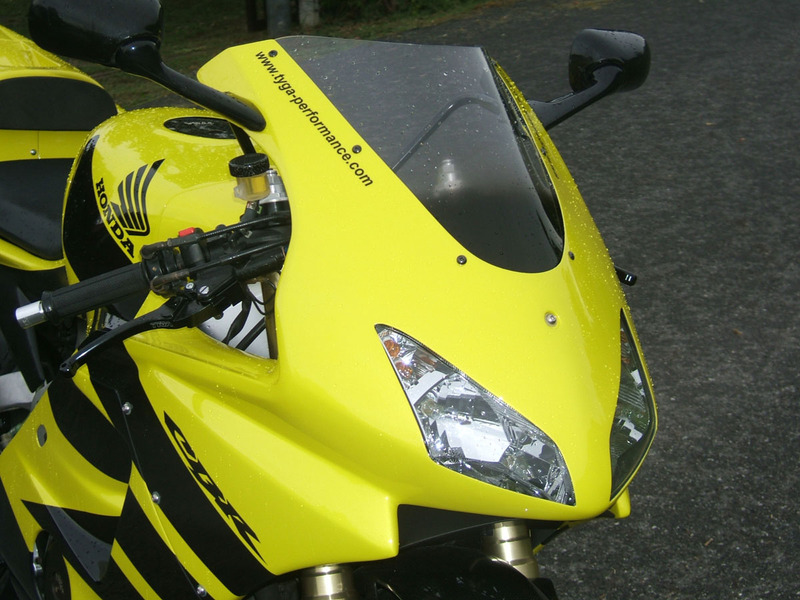 It uses the stock subframe but is supplied with a new meter stay and we fitted a new upper/mirror stay as a matter of course. 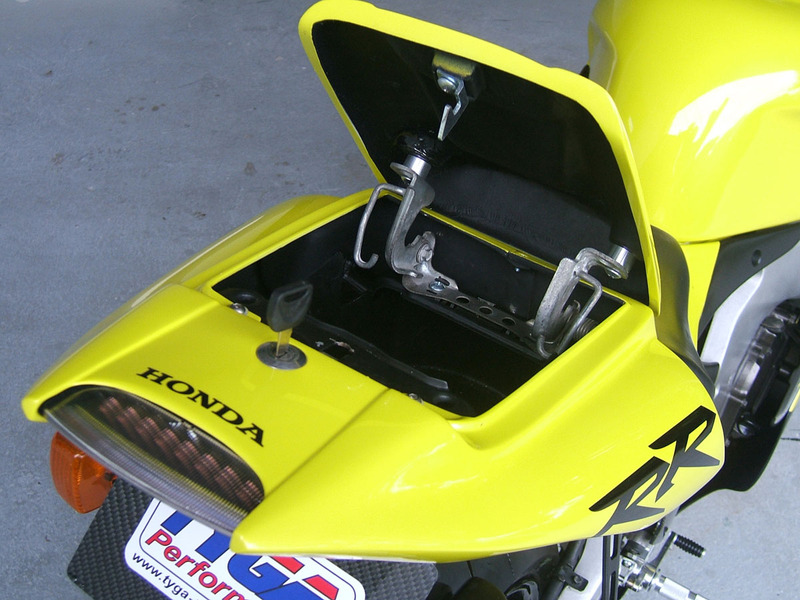 The kit is practical as well as stylish and there is still a lockable luggage compartment. 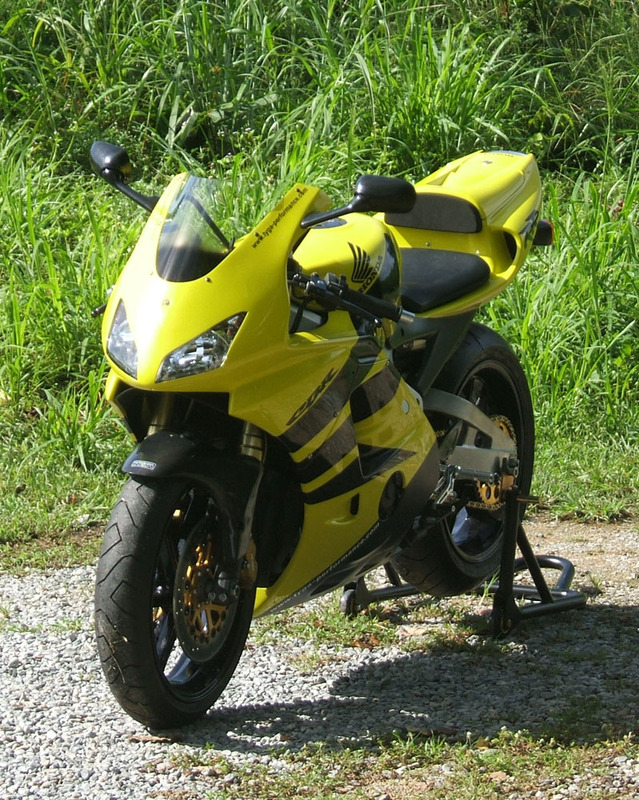 It uses stock mirrors but the headlight and tail lights are included and update the looks of the bike. The headlight bulbs are halogen and the taillight LED. 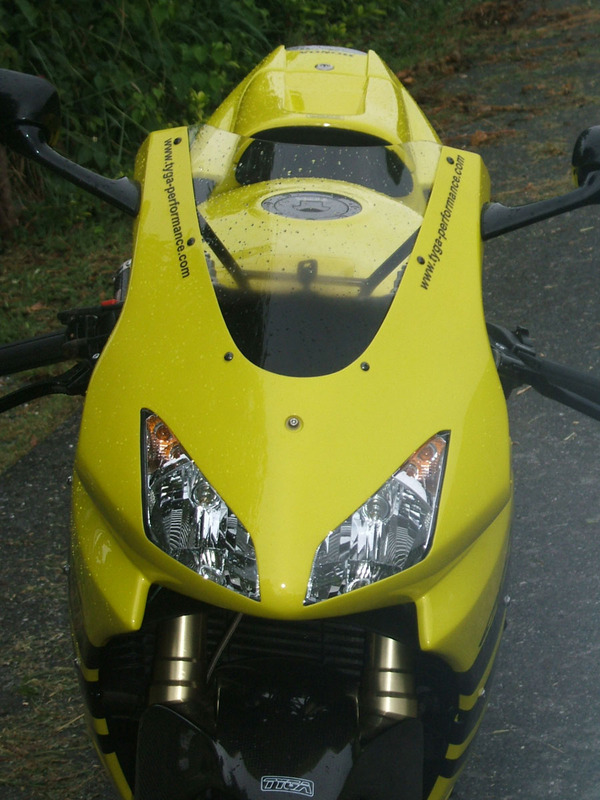 The bodywork is finished in a yellow metallic with black wing and underside. 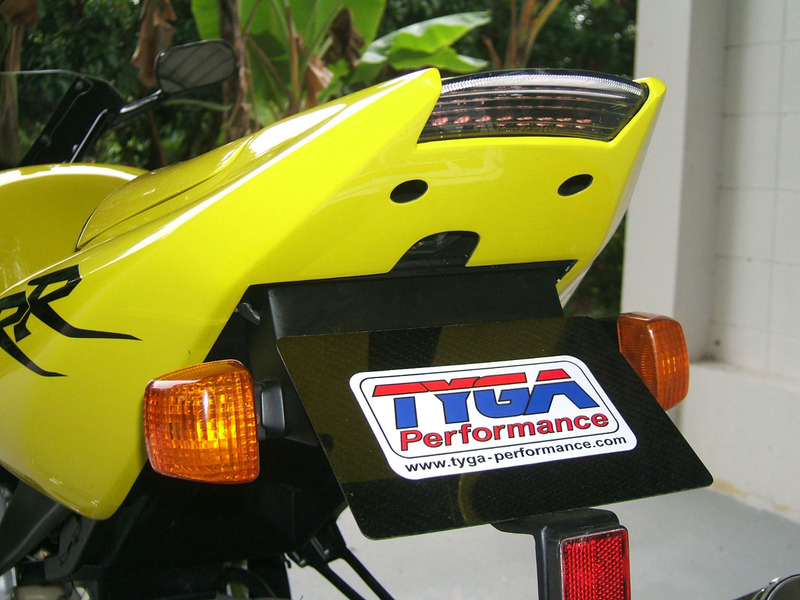 The front fender is an RC211V style carbon one for the NC35 front end. 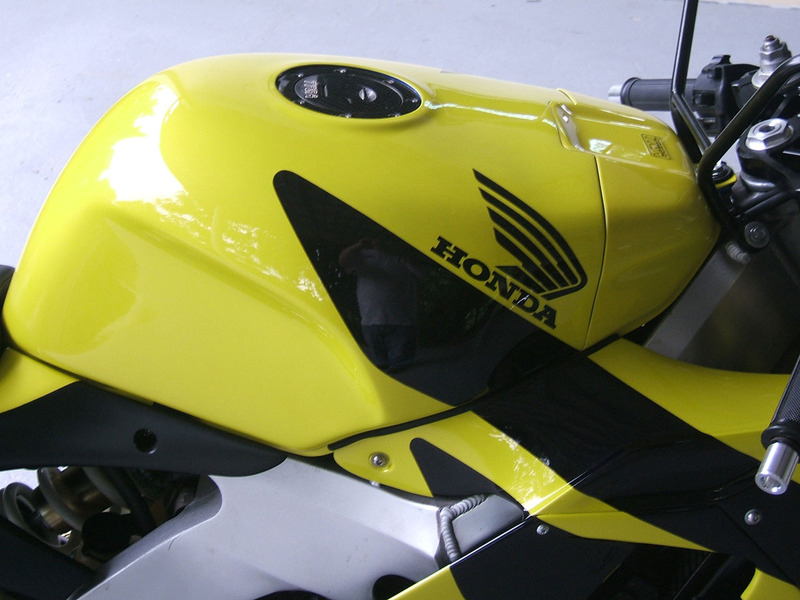 There are other carbon touches such as the tank filler and the instrument surround as well as the already mentioned carbon heel guards on the step kit. 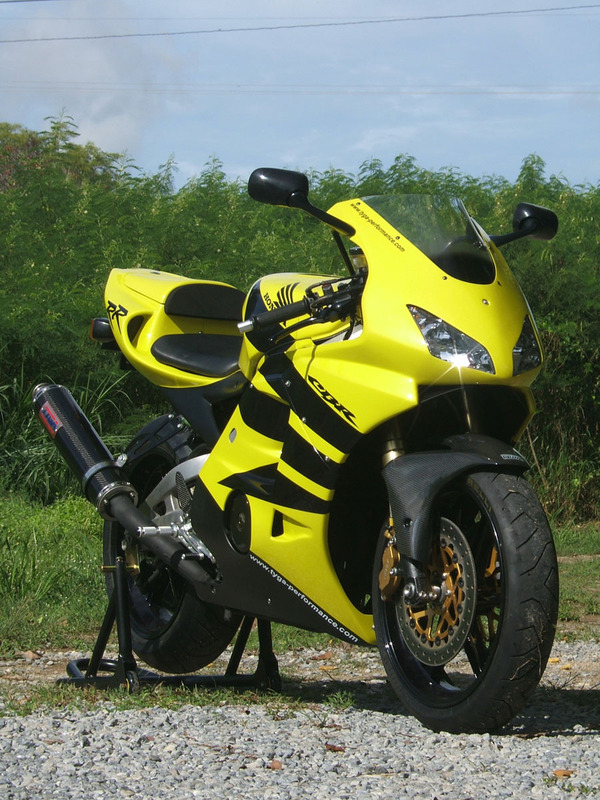 This bike has our tank cover fitted. 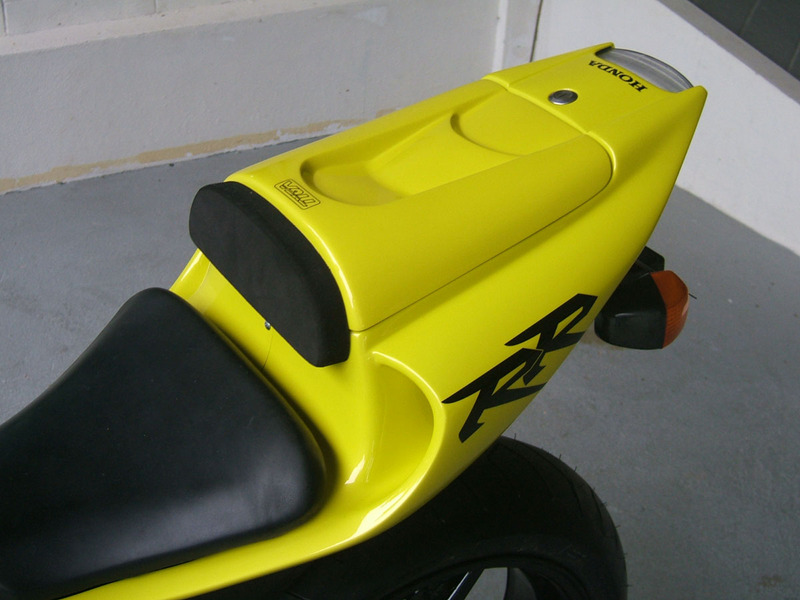 The cover fits neatly over the original tank and this has the benefit of not only protecting from or hiding accident damage, but it means that we can supply you a complete painted kit including tank cover so there is no messing around waiting for paint or looking for another tank while you are using your bike.